Goal-scorer Jake Mason in action for Peterborough Northern Star at ON Chenecks. Photo: Tim Gates. Deeping Rangers are determined to push Peterborough Sports all the way to the United Counties Premier Division title. The city side’s 3-0 win at Boston Town today (March 25) moved them to within four points of back-to-back Championships, but second-placed Deeping’s 6-0 home win over Rothwell Corinthians has kept the leaders ‘honest’ for another couple of games at least. Peterborough Northern Star's Matt Barber (left) challenges for possession at ON Chenecks. Photo: Tim Gates. Avelino Vieira bagged his 50th goal of a memorable season in Sports’ win. Lewis Webb had opened the scoring in the first-half with Josh Moreman adding a second goal after the break. Scott Coupland (2), Tom Waumsley (2), Dan Schiavi and own goal delivered a third straight win for Deeping. They’ve scored 12 goals in that run - five arrived in the second half today. Wisbech Town and Holbeach United both kept up their pursuit of a top six place with fine away wins today. The Fenman won 3-0 at Sleaford with three goals in the final quarter of the game, while the Tigers were 4-2 winners at Harborough Town. Goalkeeper Sam Vince netted his third penalty of the season for Wisbech to put them in front. Michael Frew and Leigh Adams were also on target. Avelino Vieira (blue) scored his 50th goal of the season for Peterborough Sports at Boston Town. And Peterborough Northern Star completed a clean sweep of Premier Division wins for the five local teams in action. A goal 15 minutes from time for Jake Mason was all they required to win a hard-fought contest at ON Chenecks. Star had the better of the chances in a tight game. A fine pass from Lee Barsby to Jezz Goldson-Williams set up today’s victory - a first in five games for the city side. Bourne won 1-0 at Long Buckby in Division One thanks to an 89th-minute goal from Jack Humphries. 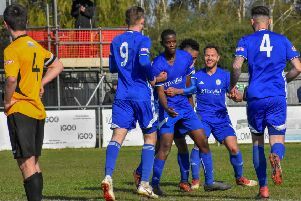 There was a stand out success in Division One South of the Evo Stik Northern League as play-off bound Spalding Town trounced Leek 4-0 away from home. An attempted overhead kick from Kieran Blanchard for Peterborough Northern Star at ON Chenecks. Photo: Tim Gates. All the goals arrived in the first half for the Tulips from Brad Wells, Nathan Whitehead, Jordan Lemon and Cenk Acar. Spalding remain third, 10 points clear of the pack chasing a play-off place. Stamford AFC attracted the division’s highest attendance of the day to the Zeeco, but most of the 326 went home disappointed with a 1-0 win for Gresley. The winner arrived in the final 20 minutes. March Town and Wisbech St Mary were both beaten in Division One of the Thurlow Nunn Eastern Counties League. Sleaford Town 0, Wisbech Town 3 (Vince, Frew, Adams). Long Buckby 0, Bourne Town 1 (Humphries). Wisbech St Mary 0, Haverhill Borough 1.